Is your child confused about why some people are mean? It’s tough being a child of a selfish, or cruel parent or relative. 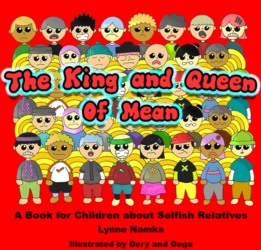 The King and Queen of Mean helps children understand narcissistic behavior and the erratic actions of people with personality disorders. This book gives a light-hearted explanation about the self-involved behavior of family members. It teaches children to observe how people treat each other so that they can make informed choices about taking care of themselves. The book does not use the word narcissism. As your child grows up, he or she will encounter the concept of personality disorders and draw their own conclusions about the actions of egotistical, self-centered family members. It includes two articles on helping children when divorcing or sharing custody with a personality-disorder parent. The book was written by the author of the popular website LynneNamka.com who writes extensively about narcissism. Twenty adults who grew up with a hateful parent gave input to the content of this book which helps children understand malicious adult behavior.